This month we caught up with Katie Larmour, owner and creator of Katie Larmour Design. 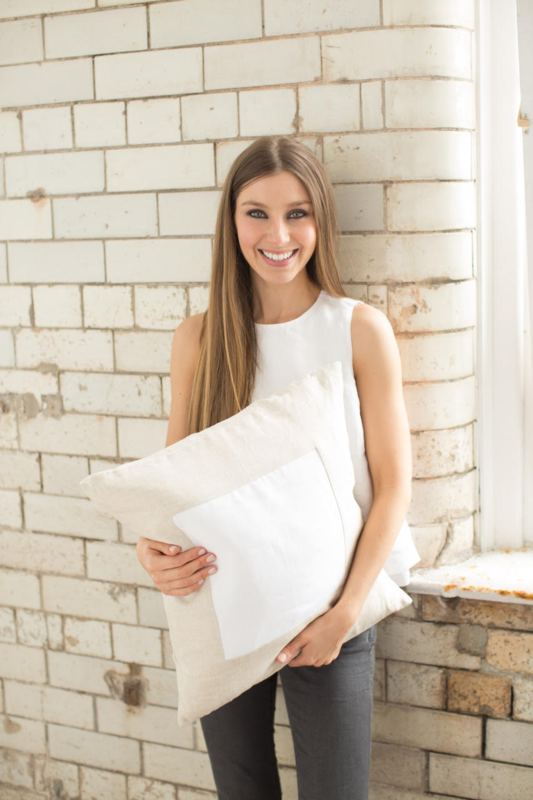 Katie is an Irish Linen designer-maker who creates ‘luxury couture cushions’ from her studio based in Belfast. Katie’s unique work has caught our eye over the years and we were excited to spend some time hearing more about her journey with Irish Linen. Can you tell us a little about your journey within the fashion and textile industry? I have been involved with Belfast Fashionweek for a number of years now, both as the official ‘face’ of the event through their advertising campaigns, as stage host, and also as presenter of ‘Belfast Fashionweek TV’. I love interviewing all the up and coming designers behind the scenes and hearing their stories. Fashion has definitely been an influence in my work, directly in the use of precious antique and vintage designer silk scarves which are a fashion item that I transform into one-of-a-kind luxury cushions, and then also with some of my ‘Artisan Linen’ designs. These are cushions created from linen alone, as in my two signature pieces, the bow and the rose cushion, which have been inspired by the flamboyant bows and elaborate flower-like ruffle detailed on couture dresses like the 1950’s Dior, Valentino or Giambattista Valli ballgowns, whether it’s oversized shapes of sweeping fabric or in tiny intricate details. My cushions are artisan made, constructed in a similar way to a bespoke garment by skilled seamstresses with precision and care, the cloth sculpted by hand and the finishing touches hand stitched. In a world of throw-away fashions I wanted to create products that felt timeless and more enduring in a world of ever changing fads and trends. They sound very intriguing, tell us more about the scarf cushions? I collect high end designer silk scarves such as Hermes, Chanel and Cartier in an eclectic mix of rare and unusual vintage colour-ways and fashion them into one-of-a-kind cushions, which are, of course, backed in Irish Linen. I source these from the best markets and antique dealers in Paris. My favourite place to hunt for treasure there is ‘Les Puces de Saint-Ouen’. It’s very fitting that these precious fabrics found in such an elegant city be matched with Irish Linen which is often referred to as the aristocrat of textiles. I prefer to use Irish Linen in its natural undyed form which is very fresh, its unique shade seeming to complement every single colour of scarf I use no matter how vibrant. I sell these through a New York based antique dealership called 1stdibs. Have you a favourite piece that you have produced? There have been a number of them, including a few of my antique silk scarf cushions that I know I will never find again, as they are such gems and one-of-a-kind beauties, but if I kept every one that I fell in love with my house would be coming down in cushions …in fact it already is! A favourite pattern must be ‘Gloria’, a celestial looking print by Hermes, as I seem to keep buying the same one over and over again, but in different colour-ways. How did the vision for Katie Larmour Design come about? I studied Fine & Applied Art at the University of Ulster Art College where I specialised in ceramics, but although my end of year show was focused on that medium, I was experimenting with Irish Linen even then. I combined textiles and porcelain with a delicate slip-dipping method which resulted in beautiful patterns being imprinted and fossilised within the clay. With Irish Linen being so imprinted in our city’s history and heritage I was intrigued to incorporate it into my ceramic pieces, and so took the first step into the field I am in today. Have your travels impacted on how you design? Absolutely, I love to explore new places and absorb new cultures. I travel a lot and I find a wealth of inspiration everywhere I go. Last year on a trip to Venezuela I was lucky to have a private tour of ‘Villa Planchart’. It is a modernist gem by the celebrated Italian architect Gio Ponti and I was shown round by the nephew of the patron. The interior was magical and I was very impressed by the unique Mid-Century Modern decor full of fantastic geometric furniture and dramatic spaces. My ‘Tara’ cushion would fit in there perfectly. It’s the essence of the clean lines and boxy forms of the Modern Movement in art that I’ve tried to capture through my contemporary patchwork. I ended off that same year with a visit to the architectural masterpiece ‘Casa Luis Barragán’, the house and studio of Luis Barragan in Mexico City which is another development of that same aesthetic. Next on my list to visit is the Irish Modernist Eileen Gray’s villa ‘E-1027’ on the French Riviera; that would be a dream to see how an earlier Irish woman designer worked in the Modernist idiom. When you begin a new collection, where do you look for inspiration? I’ve just recently completed a set of contemporary patchwork Irish Linen cushions for Heal’s of London, on sale at their flagship store for Spring/Summer 2017. Because the collection was exclusive to them I looked to their archive of iconic furniture from the past for inspiration, to draw up something special to them, and that’s where I found a range of minimalist shapes. Heal’s has a fascinating design history which spans over 200 years, with a particularly strong background in the Arts & Crafts movement, Modernist designs, traditional craftsmanship and high quality materials, so there was a natural synergy here. I used clean lines with no frills, eliminating unnecessary seam-lines to create bold block geometrics with harmony and proportion. My goal was to make a collection that could be ‘mixed and matched’. I’ve done this by keeping the colour scheme neutral and using the same combination and textures of fabric throughout, so theoretically they should all complement each other. I’m delighted to be collaborating with such an iconic and prestigious company, whose own history was inspiration itself. Congratulations on winning a place with the British European Design Group, what was it like exhibiting with them in NYC? The BEDG promotes British talent to international markets. Once I learnt I was going to showcase at ICFF, North America’s luxury International Contemporary Furniture Fair, I got to work designing a whole new collection, as all my pieces up until then had been one-offs and therefore I could not reproduce them for a wholesale market. The collection I eventually exhibited there was picked up by a beautiful interior design boutique based in the Hamptons. On the journey home, I stopped by the Caribbean to add some of my bijou accents to a private villa there. It was an amazing experience to be taking part in New York Design Week, not to mention the opening night party in MOMA (the Museum of Modern Art). Having visited the gallery many times during the day it was really cool to get in to see it after normal opening hours. I’ve since been invited to take part in ‘Maison & Objet’ in Paris later this year so I’m really looking forward to that. Tell us why you love Irish Linen? Firstly, for its unique look, colour, feel and texture which is unparalleled. It’s very special as not only does it encapsulate our history and heritage but it’s an excellent eco-friendly choice. There has recently been a widespread and fashionable return to natural fibres, which makes Irish Linen all the more desirable now. Made from the flax plant it’s cultivated using just a little water, and so is an alternative to crops that seem to rely on fertilisers and pesticides. Basically, grown as a weed, it is transformed into the most luxurious of fabrics today, and the whole plant is also used, making it a waste-free crop. I’m also fascinated by the old production methods of the past and found some historical photographs documenting the bleaching process whereby rows of long lengths of linen were laid out on the fields to be whitened by the sun’s rays. These archival photographs have been a source of inspiration for my designs. From a high level view the dramatic stripes created by ‘bleaching greens’ was astonishing and made very striking patterns across the landscape, and so I tried to translate this image into my cushion design ‘Erina’. I love visiting all the old linen mills that are scattered across the country, as they contain so much history and character, Clark’s of Upperlands being a picturesque example with its old stone buildings with soaring red clay brick chimney set within a luscious woodland. Do you feel you are contributing to part of a revival of Irish Linen? There is a sense of that, which is very gratifying, and it’s nice to think I’m celebrating what our city was known for, our industrial heritage. At one time, there were tens of thousands of mill workers in Belfast alone, and now there are only a handful of mills left in the whole country still producing linen, but its niche is the luxury market. It’s a beautiful fabric with so many appealing qualities but it tends to be offered in quite a traditional way, whereas my aim is to create contemporary designs with a fresh approach and I love the idea of helping to keep this wonderful fabric alive and being able to promote it abroad. I always like visiting art galleries and museums wherever I go, and it has always been a pleasure in my spare time, although it often ends up as a stimulating influence in my work. I’m passionate about my design business so I never really 100% switch off. Experimenting with making quilts is very time consuming but also therapeutic. I construct them with what are essentially the left-over pieces of linen from my cushions and so the size and form of these sections often dictate the shapes in the piece. I see them as one big picture and often look to icons of abstract art like the paintings of Rothko, and the graphics of the Russian Suprematists, and the Dutch De Stijl group for inspiration, which brings me back to my favourite hobby in my spare time – going to see these original works in galleries around the world. Katie’s Heal’s cushions can be seen gracing the front cover of this month’s House Beautiful magazine, and her silk scarf creations are featured in ‘Antiques & Home Magazine’. Visit www.katielarmourdesign.com to see more.